The hatred is almost universal—by now, even late night TV hosts are bashing Apple's move to ditch the headphone jack in the iPhone 7. It's not like the disdain is baseless, either, because there are plenty of problems that come along with removing the iPhone's only analog sound output. But one major issue we see is the new EarPods' compatibility with Apple's other devices—namely their MacBooks. Many people want to use the same headphones with their iPhone as they do with their MacBook, but with the iPhone 7's Lightning-equipped earbuds, this just isn't possible. The Lightning EarPods that come with the iPhone 7 won't work with existing MacBooks, and adapters won't do the trick, either. To put it simply, Apple has painted themselves into a corner here. A corner that hurts the customer and forces them into spending $160 on Apple's AirPods or another wireless headset to be able to use the same headphones on both their Mac and iPhone—or using a set that requires an adapter to be in your pocket at all times. The iPhone 7 comes with a set of EarPods that plug directly into the Lightning port, but none of the existing MacBook models have a Lightning port. While Apple included a mini-jack-to-Lightning adapter with their new iPhone so that you can plug traditional headphones into it, this cable doesn't work the other way around to plug Lightning headphones into MacBooks. So... you might think that a Lightning-to-mini-jack headphones adapter would do the trick by letting you use your iPhone 7's stock EarPods with your laptop. It would be easy to toss one of these into your MacBook carrying case. But sadly, this isn't possible. The Lightning EarPods included with the iPhone need power to convert audio from digital to analog... and the 3.5 mm jack on your MacBook is not powered. So ultimately, you have two options for wired sound output, and they both involve carrying at least two cables with you at all times. First, you could keep that mini-jack-to-Lightning adapter with your iPhone somehow (tape? Velcro? ), then just use a traditional 3.5 mm headset with both devices. Secondly, you could use Lightning headphones with your iPhone, then switch to a set of regular earbuds or other style headphones for your Mac. Either way, you'll be tangled up in cables as you switch between two Apple products—so much for "seamless integration" and "it just works." Obviously, the easiest solution to this problem would have been to not remove the damn headphone jack in the first place, but this wasn't in the cards. If they absolutely had to get rid of the 3.5 mm jack, a better option would have been to replace the Lightning cable on the iPhone with USB Type-C. This new port is a universal standard used in a wider variety of devices than Lightning (including Apple's most recent MacBook), and it's a more capable connector to boot. USB Type-C supports analog audio output, so the complaints about Apple's new setup causing a drop in audio quality would have been silenced. To top that off, USB Type-C headphones would have worked with Android devices, which would help if you owned an iPhone and an Android tablet. But the biggest difference this could have made was the fact that it would be compatible with some existing MacBooks out of the box. The latest standard MacBook already has a USB Type-C hookup, and Apple plans to include USB Type-C in future models. So if Apple had gone this route, their phones and computers would have worked together with the same level of seamless integration they've always been known for. Apple will probably try to spin this whole situation as another advantage of their new AirPods, which will work with both iPhones and Macs. But people really don't want another device that needs to be charged constantly, and Bluetooth, the underlying technology in AirPods, has worse audio quality than wired headphones. That's not even mentioning the $159 price tag for AirPods or the fact that you'll probably lose one in the first week, seeing as how they're so tiny. So no, AirPods won't do. We need a wired solution—one that works with both iPhones and Macs. 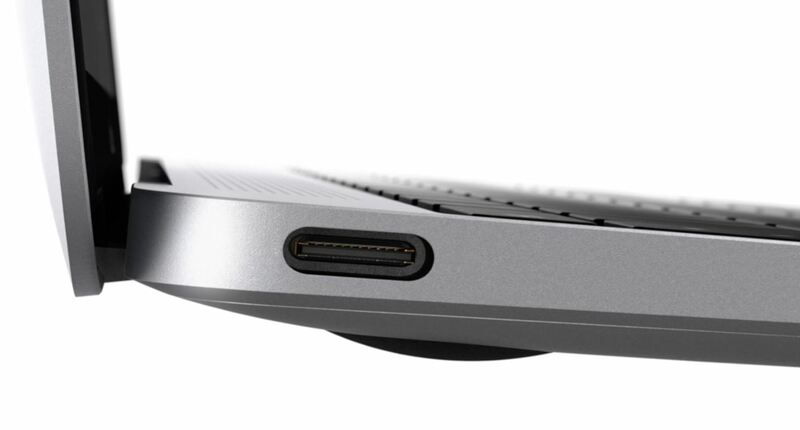 That leaves Apple with only one logical move: Add a Lightning port to their MacBook lineup. This way, you could take the EarPods out of your iPhone 7, then plug them directly into your MacBook like you've always done. But will this happen? Probably not. Apple switched to USB Type-C in their 2015 MacBook to ensure that the laptop was as slim as possible. Not only does USB Type-C let you connect peripherals, but it also supplies power, so it's the only digitally-equipped port on Apple's latest MacBook model. Adding another port to accommodate Lightning headphones would make MacBooks thicker, and Apple would never do that—so we'll probably be stuck juggling adapters for the foreseeable future. Great article. The point about using USB Type-C makes a lot of sense. That said, I can see the whole industry shifting towards wireless earbuds now that iPhones are essentially meant to be used with them. I mean, whether we like it or not, The 7S or whatever will probably come bundled with AirPods, and it's hard to deny they are actually quite ingenuously crafted. Yes, they are expensive, the audio quality will probably be pretty average compared to even entry-level IEMs, and they won't work with anything non-Apple (that's enough for me not to buy them), but that's how Apple has been doing things (successfully) for decades now. I don't buy Apple products, but I'm glad they're helping pushing the industry forwards in their own way. Very good points! I personally don't use wired headphones very often because I'm fine with Bluetooth. Considering that, I'd love it if this move pushed the rest of the industry to make higher quality wireless headphones. "Adding another port to accommodate Lightning headphones would make MacBooks thicker." It's just an assumption, so I could be wrong. But they have that USB-C jack at the widest point, and it tapers down to almost nothing from there. Maybe they could rearrange internals to fit Lightning on the other side. But Lightning can't supply enough power to charge a MacBook like USB-C can (the voltage rating is way lower), so they'd have to keep USB-C to keep future MacBooks as thin as they are, and that would mean they'd have to find room for both. Maybe on the bigger models.